Welcome to the Original Vienna Halloween Pub Crawl! We are hosting a massive event to celebrate our favorite holiday! Dress up in your most impressive Halloween costume for a chance to win a bottle of Prosecco, and if you didn’t have time to put together a costume, free face paint will be available. All guests will get to enjoy 1hour of unlimited beer/wine before we head out into the night to explore just what Vienna’s Halloween nightlife is all about. Venture into the famous Bermuda Triangle with candy, free shots, themed bars and clubs. This Halloween pub crawl is truly a treat, with no tricks involved! 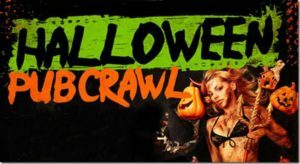 This Halloween Pub crawl is going to be a one of a kind event! We love the Vienna nightlife and we are happy to bring you the Original Vienna Pub Crawl, we ask that you please drink and act responsibly! Check us out at the meeting point or reserve your spot online! Don’t worry if you don’t have a costume we will have face painting and small props at our meeting bar! For Pics from our recent crawls check out our facebook page! If you have a large group or any questions you can contact us by email.